AS Monaco are through to the semi-finals of the Champions League after brushing aside Bundesliga giants Borussia Dortmund. The Ligue 1 leaders carried a 3-2 advantage into tonight’s game, and it didn’t take long for them to build on that. 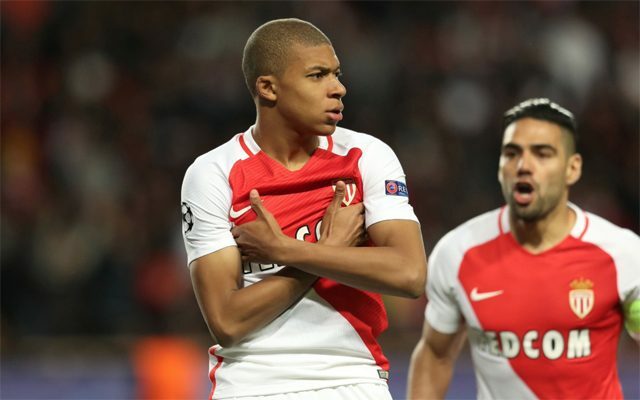 Prodigy Kylian Mbappe found the back of the net with a smart finish after just three minutes to put his side ahead on the night. In doing so he became the first player ever to score in their first four Champions League knock-out games – he’s only 18-years-old. Click here to see his goal. Less than a quarter of an hour later, Monaco added a second. Benjamin Mendy whipped in a cross from the left-hand-side towards former Manchester United and Chelsea striker Radamel Falcao. ‘El Tigre’ met the cross and headed home to extend his side’s advantage. You can see Falcao’s 24th goal of the season here. Borussia Dortmund, who have endured a nightmare week, were not going to give up there, however. Ousmane Dembele got the better of Mendy on the right-wing and delivered the ball into the path of Marco Reus. The German international found the top right-hand corner on the spin to give Dortmund hope. Click here to see Reus’ goal. Monaco appeared insistent not to allow Dortmund any avenue back into the game, and any hopes they may have had were swiftly eradicted by Valere Germain. He found the back of the net just 21 seconds after coming on as a substitute to put the tie to bed. That proved to be enough to take Monaco over the line, and they will be in the draw for the last four. Here are our player ratings for both sides.